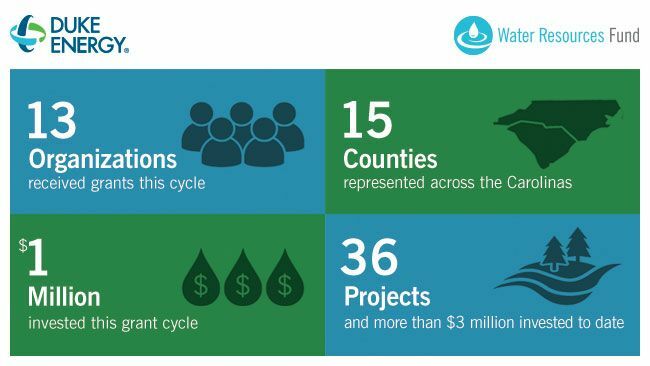 CHARLOTTE, N.C. -- Thirteen organizations in North Carolina and South Carolina will share more than $1 million in new grants from the Water Resources Fund to improve local water quality. The fund is a $10 million, multiyear commitment from Duke Energy to help local nonprofits continue to protect and improve the environment, including waterways used year-round across the Carolinas and neighboring states. The fund was announced in September 2014 and included eight seed grants. Fifteen inaugural grants were made in March 2015. Recipients are selected by an independent body that includes five environmental experts and two Duke Energy employees. "Local organizations are vital to protecting waterways across the Carolinas," said Shawn Heath, vice president of The Duke Energy Foundation and Community Affairs. "Already, we're seeing good things happen due to this fund, including a new nature preserve that recently opened in Wake County and a streambank that was restored in Watauga County. These are projects that will have a lasting impact on the environment for decades to come." Bridge II Sports (NC) ADA access at Lake Crabtree – $100,000 to fund a boathouse for equipment that supports water activities for the disabled. Carolina Mountain Land Conservancy (NC) Sitton Creek Protection and Restoration – $100,000 to enhance water quality in Sitton Creek and expand public access by adding 178 acres to Pisgah National Forest. Conservation Trust for North Carolina (NC) Betsey's Rock Falls Conservation Project – $85,000 to acquire a 34-acre conservation easement along creeks and a waterfall in Wilkes County. Davidson College (NC) Understanding connections among discharge, chemistry and ecology in first-order Piedmont streams – $55,410 to study the impact of water quantity and chemistry on aquatic ecosystems in headwater streams of the Rocky River and McDowell watersheds. Durham Soil and Water Conservation District (NC) Durham County and Wake County Community Conservation Assistance Program – $100,000 to implement best practices along the Jordan Lake Watershed. Eno River Association (NC) Protecting the Eno River corridor and creating a new gateway to the North Carolina Mountains-to-Sea Trail – $30,000 to secure the last unprotected river buffer from Pleasant Green Road to Eno River State Park's northwest boundary. Girl Scouts, Hornets' Nest Council (NC, SC) Wonders of Water and Wildlife (WOWW) – $99,988 to increase community awareness of protecting water resources through hands-on learning experiences for Girl Scouts from eight counties attending their leadership development camp near Statesville, N.C.
Maggie Valley Sanitary District (NC) Protecting Sheepback Mountain's Water Resources – $100,000 to protect the watershed within Sheepback Mountain. Rockingham County (NC) River Access on the Dan River and Environmental Park – $91,000 to provide needed river access on Dan River, riparian forest improvement and environmental education. Town of Oakboro (NC) Land purchase for canoe/kayak launch – $100,000 to convert current park property into a public park, allowing access to Rocky River by a canoe/kayak launch. Beautiful Places Alliance (SC) Lake Craig Fishing Pier at Croft State Park – $75,000 to build a fishing pier to expand outdoor recreation opportunities provided by the South Carolina Park Service at Croft State Park. City of Conway (SC) Waccamaw River Park and Recreational Area – $100,000 to support a river tract that is part of a conservation network that protects coastal wetlands and water quality adjacent to Conway, S.C.
Rocky River Conservancy (SC) Rocky River Wetland Restoration – $30,000 to improve the water quality and the plant and animal species in a 6-acre wetland by installing a solar-powered water pump. "We're excited to receive the Duke Energy grant for our Sitton Creek project," said Kieran Roe, executive director, Carolina Mountain Land Conservancy. "The grant will help protect and restore the quality of the Mills River watershed, a source of drinking water serving hundreds of thousands of users in Henderson and Buncombe counties in North Carolina." "We are grateful to Duke Energy for providing a Water Resources Grant that helps us expand recreational opportunities at Croft State Park," said Duane Parrish, director of the South Carolina Department of Parks, Recreation and Tourism. 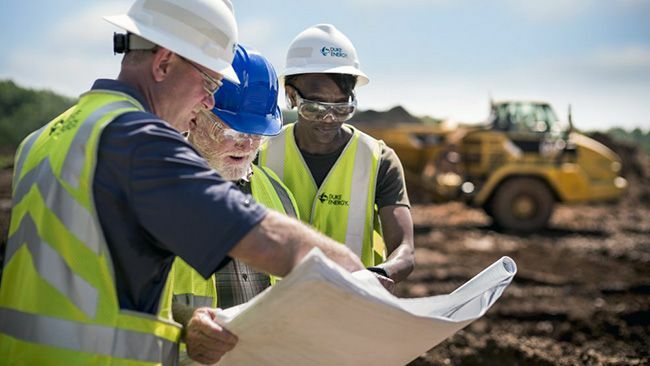 "It will be a great place for Duke Energy's customers and all park visitors to bring their families, fish the lake and spend quality time together."